The Long weld Neck flangesis available in a variety of sizes, shapes, thickness, and dimensions. As a manufacturer and supplier, GuruGautam offers you all grade of Long Weld Neck Flange at market leading prices. 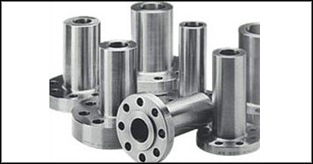 These types of flanges are most useful in a wider range of industrial applications. These flanges are produced by premium quality raw materials and using modern machinery tool in order to provide precise design and accurate dimensions. You can collect this Long Weld Neck Flange from GuruGautam supplier. Before delivery of this product, they conduct various testing to deliver product in terms of best quality and services. Type of Flanges : Weld Neck Flanges - WNRF, Socket Weld Flanges - SWRF, Slip On Raise Face - SORF Blind Raise Face - BLRF, Spectacle Blind, Ring Joint, Large Dia Flanges, Orifice Flanges, Girth Flange, Lap Joint Flanges, Screwed (Threaded) Flanges, Long Weld Neck Flanges, Reducing.